The all new, and all cool Pikachu Nintendo 64 has come out in North America! It is a blue N64 with a Pikachu on top, a pokeball as the power button, and a cool Pokemon controller. To reset the game, press on Pikachu's foot! This is a great N64 for Pokemon fans, especially fans who plays Pokemon Puzzle League, Snap, Stadium, and Hey You, Pikachu!, coming in November!!! You might have noticed a few days ago, I removed PCN(renamed to PWN and was just up for a few days) and the topsites. Why did I remove them? You should be asking yourself. None of you are joining the topsites, and I'm not getting enough hits. So if you can visit everyday, then I'll probably get it back up. Invite all you're friends here. Do whatever you can to get Pokemon Wave more hits. I removed PWN because I get really frustrated when working with CGI scripts. Gold & Silver Gameshark Codes are finally up, thanks to Alexx. The new message board is up at http://pub30.ezboard.com/bpokemonwaveforums. Also, my staff Alexx has a few words to say. Get Celebi (Seribi) with gameshark! It's a Psychic/Grass Type. It's initial attacks are: Confusion, Leech Seed, Heal Bell, Revive. Mine just learned so far, it's learning habits are similar to Mew's.It learns an attack every 10 levels, Lv. 10, 20, 30, and 40. Every few days I will post a new Celebi's Journal, updating all you Pok�-maniacs out there! This is Alexx signing off! Good day! Okay, Alexx, my staff, sent me some Gold & Silver Gameshark codes, which I will put up later. Hope you all go there to take a look. I'll also be putting up a fan art I drew on Paint, and a fan fic that I wrote myself. I've already uploaded half of the stuff from The Pokemon Center, so I'm almost done. Unfortunately, there are currently a lot of broken links. But everything will be fine in about a few days. PCN is up at last!!! What is PCN, you ask. It stands for "Pokemon Center Network". What is a network, you ask. A network is something you join if you need to be hosted, or just need more hits. The pages for PCN isn't up yet, but if you want to get hosted immediately, please contact me at wei88_1999@lycos.com and e-mail your current site's URL to me. PCN's main page will be up soon, so come back frequently if you are looking for a host. The nation's largest depository for precious metals is getting a bit richer. At an official national launch event at Fort Knox, Nintendo of America Inc. is celebrating the release of two of the most highly-anticipated Game Boy Color games ever: Pokemon Gold and Silver. Hundreds of kids will be among the first in America to play the new games, which have already pre-sold an astounding 700,000 copies. Both games are on track to become the best-selling video games in U.S. history, expecting to sell a record of 10 million units by spring 2001. Pok�mon Gold and Silver will be available October 15 for a suggested retail price of $34.95 each. "Fort Knox is the nation's center for gold and silver and the ideal location to introduce America to the richness of Pok�mon Gold and Silver," explains Gail Tilden, Nintendo's vice president, product acquisition and development. "Gold and Silver are truly the next level for the Pok�mon franchise and are poised to raise the bar for blockbuster game sales and pure interactive fun." I'm just very glad that Alexx, my one and only staff, ran into me. He is a great staff, I must say. Alexx just got some cheats for me, and I think I'm gonna put them up tomorrow, so be sure to come tomorrow if you are really crazy about cheats! Better walkthroughs will be up, so come often!!! We finally got a staff! The name is Alexx, and the age is 13. Alexx will be writing some codes and doing the walkthroughs. But that's not all today. The Pokemon Center had 138 hits yesterday, another new record!!! TCG Rulesis up. It's not TCG Rules, the rules as in the king ruled the country. This is the page where it states the rules to play Pokemon TCG. It isn't the complete rules, but if you just started playing, please go there.I'll also be taking out the Poke-Status since I don't really have time to go there and edit it. Yesterday, something amazing happened. The Pokemon Center got 102 hits that day, the highest ever since it opened! Today, I'm getting tons too. I got all those visitors all thanks to Maktos Top 100, and Ad Exit. Also, Pokemon Center Forums(our message board) already has one member who joined. Please be the next one at. To go there, please click here. If you have any suggestions or questions, please feel free to e-mail me at wei88_1999@lycos.com. I just wanted to tell you all that Pokemon Gold & Silver will be released in the U.S.on October 14th, which is tomorrow. But in where I live(also U.S.A, just a different state), it was released a LOOOOOOOOONNNNGGG time ago. Also, someone e-mailed me and submitted a question for Ash. Click Here to go to Ash Answers and view the question and reply. Hey all! As you can see, I've got a new button. Hope you all like it. I've also got a new thing going! It's called Trainer Decks, and it's under the Pokemon TCG section. It tells you what Pokemon other people have in their decks. I know this isn't new, but I bet the name is new!!! :) With the help of two of my friends, Bill and Curtis, who are not only Pokemon freaks but great card collectors, I set up this page for all of you. Please come back everyday for more updates and cool stuff. Just a few things to report to all of ya. I've got a new contest up, so please click here to go. We're holding all our discussions in the Message Board. Also, please join the Top Sites to get more hits. And if you want to become a staff in The Pokemon Center, please go to the October 8th news. Thank you, and please vote for me in Maktos Top 100. 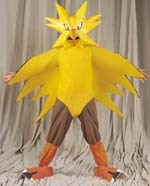 Pokemon costumes for halloween? Kids everywhere are gonna love it! 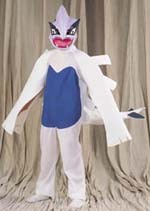 Below are two pictures of Pokemon Costumes. Below are the official names of Pokemon #152-#251. Do you want to help out in The Pokemon Center? Well, you can! I will be needing the following types of people to work for me. If any of you know C++, Java, Perl, or any other language, and you would like to help out, please e-mail me at wei88_1999@lycos.com. Or, if you know how to make cool pictures or get some good Pokemon game codes, please contact me. Thank you. As you can see, I've been able to go online a lot, and so I can get more updates. Every time you see that I have posted a new news, then your going to know that I updated something. So always look around The Pokemon Center, 'cause you might find something amazing!! !